A great way to reach a wealth of new patients and referral sources, advertising in Super Doctors helps brand you as one of the leading physicians in your area. Profiles and display advertisements are available in Super Doctors special advertising sections in leading city and regional publications. Advertising prices vary in each state; please ask the associate publisher/advertising contact in your area for more information. Three advertising options are available. See samples at right. Platinum Profiles highlight you or all physicians chosen to the Super Doctors list in your clinic. Available in a full-page advertisement or two-page spread. Please note: We will provide editorial assistance and a photographer for all Platinum Profiles. Copy limit is 300 words. Your firm will be responsible for payment for any additional photo sessions that may be needed. Profiles are designed to have a uniform and cohesive style suitable for Super Doctors sections. 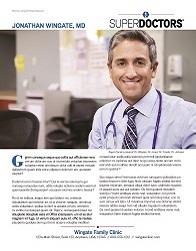 As such, the layout and design of the Profiles (including the use of color, typeface, photo cropping, sizing and placement) will be determined by the Super Doctors staff and each city or regional publication. While the final profile will be similar to the samples shown on this Web site, we reserve the right to make design modifications to ensure what we believe is the best presentation of Platinum Profiles. 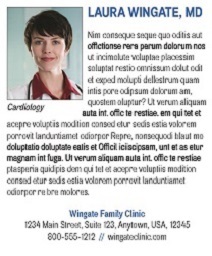 In compliance with editorial standards, the words "SPECIAL ADVERTISING SECTION" will appear at the top of every page in the Super Doctors special advertising section of the city or regional publication, including Platinum Profile pages. The Super Doctors special advertising section will not be headlined on the city or regional publication cover or listed in the regular table of contents. 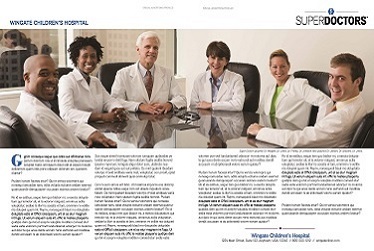 However, in magazines that include a special section table of contents, Super Doctors will be listed. Super Doctors status is in no way linked to advertising. 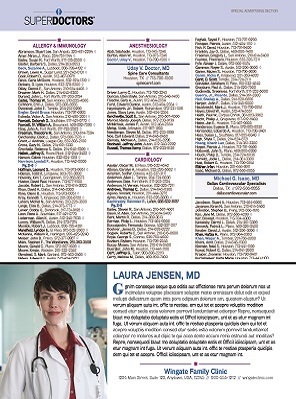 Every physician named to the Super Doctors list receives a free listing in the city or regional publication in his or her area. Display advertising positions are available within and adjacent to Super Doctors listings. Contact the associate publisher for your area, who can provide more specific information. Produce results with an expanded presentation of your credentials. Premium placement in search results - Profile advertisers appear first followed by other listings matching the search criteria. Detail of your medical specialty focus, past achievements and recognition, organized by our research. Links to your blogs, videos, social media pages, etc. Click here to view an example of an Expanded Online Profile. 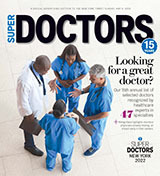 Online profiles can be ordered securely at my.superdoctors.com. Your Expanded Profile will become active immediately and your photo and other information can be added with the Profile Manager available on my.superdoctors.com. Alternatively, you can download and fax an order form.